Dust activity that engulfed parts of Greece on Thursday and again today continues tomorrow. We take a look at where Sahran dust will be concentrated tomorrow. More Saharan dust is expected tomorrow over the central and eastern Mediterranean as well as over the southeastern Europe. 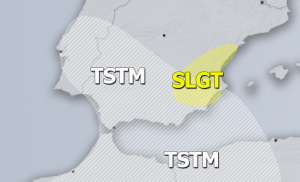 A particularly dense cloud will extend from Libya towards Crete island and the southeastern Aegean, into western and northern Turkey, across the Black sea into SW Russia. Smaller dust concetrations all over the southeastern Europe, central Mediterranean (S Italy, Malta) and the far eastern Mediterranean, including Cyprus. Note also the buildup of Saharan dust off the W coast of Africa towards the Canary Islands – a Calima event is coming!